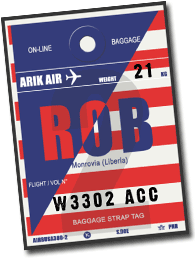 Acting on a tip off by informants, officers of the Liberia National Drug Enforcement Agency (LDEA) over the weekend arrested two women at the Roberts International Airport for allegedly possessing 8.1kgs of heroin. They made open confession, while undergoing preliminary investigation. But the suspects pleaded for mercy, claiming they were duped. They women burst into tears alleging they were “being duped by their Nigerian friend, who they identified as Paul Sirleaf, a resident of Dar es Salaam, Tanzania. They claimed Paul promised to give each of them US$15,000 each if they were to reach the items safely in Liberia. The suspects were also arrested with the contraband known as diamorphine. It is an opiod most commonly used as a recreational drug for its euphoric effects on the brain. The suspects, Cecelia P. Toby, 42, and Florence Washington, 39, were intercepted at the airport upon their return from Tanzania aboard Kenya Airways #KQ5595. They were arrested while transporting the consignment to Monrovia. The heroin was concealed in a black suitcase and cleverly disguised to pass off as an ordinary suitcase. Madam Narol Johnson, LDEA Officer who is in charge of the suspects, described the arrest as a major breakthrough in the war against drugs in the country. Ms Johnson put the street value of the substances at US$480,000. While a new director is yet to be named at the agency, Ms. Johnson assured the public of the LDEA officers preparedness to bar entry to anyone bringing illegal substances into the country through any of the ports of entry. “Nobody should ever think that the LDEA doesn’t have assigned officers at those porous entry points and try to import contraband or harmful substances into the country, because our surveillance and intelligence remain fully functional around the clock.” Johnson declared. Following the suspects’ confession, the officers were informed that Cecelia P.Toby had 4.1kg of the substance, while the rest belonged to Florence Washington. Meanwhile, the suspects will be arraigned before the Unification Town Magisterial Court in the county.